After weeks of speculation, Xiaomi, on Monday unveils Redmi 7 in China. Alongside the successor of Redmi 6, Company announced the China variant of the Note 7 Pro. Features And Specs: The new budget phone features 19:9 display and runs Android 9 Pie with MIUI 10 on top. Further, Xiaomi Redmi 7 comes with an octa-core Snapdragon 632 SoC coupled with 4GB of RAM. Under the hood comes 4,000mAh battery which claims to work alongside more than 30 software and hardware-level power saving optimizations. With the help of artificial intelligence (AI) integration, it further delivers up to 400 hours of standby time on a single charge. The phone features a 6.26-inch HD+ display with a 19:9 aspect ratio, screen resolution of 720×1520 pixels and Corning Gorilla Glass 5 protection. In terms of camera features, Xiaomi Redmi 7 sports a 12MP main camera and 2MP depth sensor. There is an 8MP camera within a waterdrop notch for Selfie which also offers face unlock functionality. Coming on to connectivity, Redmi 7 include 4G VoLTE, Wi-Fi, Bluetooth v5.0, GPS/ A-GPS, USB, Infrared (IR) blaster, and a 3.5mm headphone jack. All the variants of Redmi 7 fall under a price bracket of Rs 10,000. The base variant is offered in 2GB RAM and 16GB storage option carries a price tag of Rs 7,100. Whereas, 3GBRAM/ 32GB storage option costs Rs 8,200. Lastly, There’s a 4GB RAM/ 64GB storage variant which comes at a price of Rs 10,200. 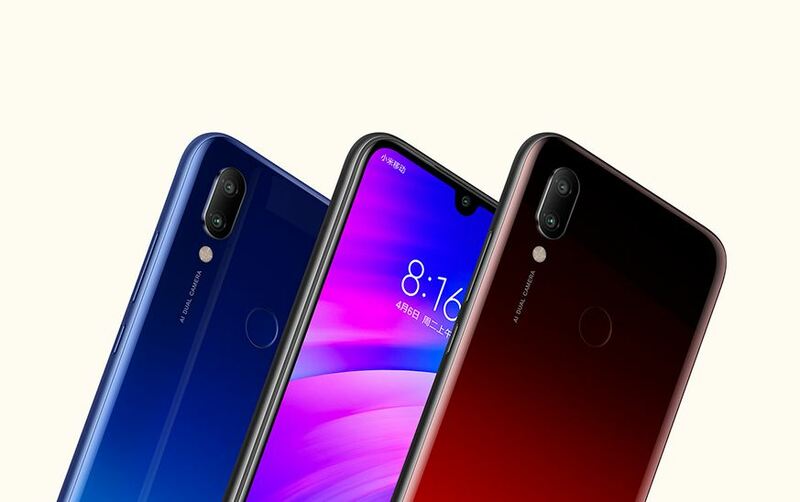 All three variants of Xiaomi Redmi 7 will come in Dream Blue, Charm Night Red, and Bright Black color options with gradient and classic finish. However, details about the India launch and availability haven’t been revealed yet. For the Latest Technology Updates & Tech News India follow us on Facebook, Twitter, Instagram, and Youtube. Previous articleXiaomi foldable phone coming by June 2019, at half the price of Galaxy Fold? Xiaomi Black Shark Helo: Here Comes Another Gaming Phone!